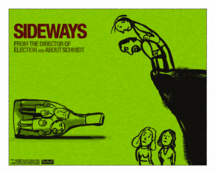 On Christmas day I went to see the Golden Globe nominated film Sideways. I'm not a movie critic so forgive me, but it was perhaps the first wine movie I've ever seen so I think it's worth blogging about. The movie is ostensibly the story of two friends (played by Paul Giamatti and Thomas Hayden Church) who are off on a wine country getaway before one of them gets married. But getaway is the last thing they do. The buddies confront each other, their past and their failures--often in the company of two strong women (played by Virginia Madsen and Sandra Oh). The writer-director team of Jim Taylor and Alexander Payne also worked on Citizen Ruth, About Schmidt and Election so it should come as no surprise at how well they manage to balance slapstick humor, dark comedy, and drama. Everyone has known someone like the happy-go-lucky "Jack" who manages to end up always smelling like a rose despite his at times despicable behavior. We also identify with Miles who after two years has still not gotten over his divorce. So what does the movie have to do with wine, other than the setting? A lot actually. While one character is a wine snob and the other an ignoramus, both their reactions to wine and to the effect of drinking it are universal. More importantly the metaphor of wine as a living thing that is handcrafted and that reaches its peak or prime before deteriorating, weaves it's way through the film. If nothing else, go see this movie to get a taste of what passion is all about--passion for wine, passion for life and passion for love.